We've been operating on an extended transportation bill for a while now, while Congress discusses what a new highway bill will look like. Considering the economy, and the mood in Washington, it's expected to be a lot different from the most recent bill, SAFETEA-LU (Safe, Accountable, Flexible, Efficient Transportation Equity Act: A Legacy for Users). For instance, Sen. James Inhofe (R-Okla.) says the only way to sell a highway bill to his Republican colleagues would be to pare it back and cut waste. Inhofe says anything that not related to transportation needs to be cut. Pet projects like Capitol dome repairs and recreational bike paths make up about 3 percent of the current bill -- an unacceptable number, according to Inhofe, considering that it draws from the Highway Trust Fund. Here's the latest on the development of a new Transportation Bill from the website for the U.S. Senate Committee on Environment & Public Works. After taking on distracted drivers, some New York lawmakers are now going after distracted walkers. There's a movement afoot (yes, bad pun I know) to ban pedestrians from using iPods, music players and cell phones while walking and crossing the street. Watch the story below then let me know if you would support a movement like this or if you think it's taking matters too far. We've been busy around here the past couple months. What have we been up to? Here's KMPO's January newsletter to get you updated. In President Obama's State of the Union speech last night, we heard a lot about working together to make things happen, new spending cuts, and increased outlays for education, mass transit and infrastructure. So speaking of mass transit and infrastructure, where do we stand as far as transportation? A civil engineers group did their own 'State of Transportation' this week and gives the U.S. transportation system low grades. The American Society of Civil Engineers says we need to think about the condition of our bridges a lot more, an overhaul of the air travel infrastructure is needed, freight needs to be moved by rail more and trucks less, and access to public transit needs to be improved as half of all Americans have no access to commuter buses or trains. Here's more from CNN on the State of Transportation in the U.S. Or, if you're more inclined, you can watch their broadcast on the subject. The commercial you're forced to sit through to watch it is even kind of amusing. Republican John Mica, Chairman of the House Transportation and Infrastructure Committee, recently gave an interview on his hopes to crank out a new transportation bill this year, even in a partisan congress. He also addressed rumors of raiding the Highway Trust Fund and stretching infrastructure money farther. You can listen to the interview here, and read the transcript. You can even download the MP3 file there in case you want to put it on your MP3 player to listen to over and over. Any thoughts after listening to/reading this? I've had a lot of folks asking about the Beck Road Interchange project lately. The local engineering firm HDR, Inc., that's managing the project, has put together an information page for the Idaho Transportation Department website. All the information you could ask for on the project is right here. If you didn't attend the first meeting for the proposed McEuen Park project, a second presentation and open house will be held Thursday, Feb. 3, at 6 p.m., at Woodland Middle School. The school is at 2101 St. Michelle Ave. The first open house was so full that there was not enough room for everyone to participate. The same materials will be presented at this second open house as the first. A proposed road extension in Riverstone West could encourage future development there. Coeur d'Alene's urban renewal agency agreed Wednesday to help make that happen, saying it could spur the development of an affordable housing complex and a permanent transit center for Citylink. The road will extend 1,700 lineal feet of John Loop Road through the 11 western lots and connect to Riverstone Drive. The Coeur d'Alene Press has the story. The former director of the now-defunct North Idaho Community Express/Kootenai Area Transit System is speaking for the first time about the cease in operations. Helen Stephens contacted The Coeur d'Alene Press regarding a police investigation alleging grand theft at the transit agency. Here's her interview. KMPO and the Panhandle Area Council (PAC) were not involved in the decision to cease service or the operation of NICE. Both are participating in talks and cooperating with the Idaho Transportation Department Division of Public Transportation and the Community Transportation Association of Idaho to restore services as soon as possible. At this point there is no word on how or when this will happen. We will provide updates on this situation as they become available. - Market the Spokane Regional Transportation Management Center (SRTMC) to the public. While it is based in Spokane and only shows Spokane roads, the SRTMC can be a great resource for Idaho residents who commute to Spokane. The long term goal is to incorporate North Idaho traffic cameras into the SRTMC so if we get Idaho residents familiar with it now, they'll be ready and willing to use it when we start covering Idaho traffic too. - Revise the KMPO Public Involvement Policy to make sure we are reaching all sectors of society. Plus a million other little things that will come up between now and the end of the year that will take up most of my time. It seems mundane, but that's my list. What's your thoughts? This is just the 'public outreach' end of things because that's what I do, but are there any major areas KMPO is missing? According to the Coeur d'Alene Press, Coeur d'Alene's City Council tonight will consider forming a local improvement district (LID) tonight to fund improvements on Government Way from Dalton to Hanley avenues. City staff is requesting approval of an ordinance establishing LID 150 for the installation of water and sewer facilities on Government Way, Park and Sunup avenues. Any comments? Public transit in Kootenai County is on kind of shaky ground lately. North Idaho Community Express/Kootenai Area Transit System ceased operations a couple weeks ago due to budget problems, and now the Coeur d'Alene Tribe, the major contributor to the Citylink transit system, says it's time for local agencies to develop alternative funding sources before transit service is affected. The Tribe isn't giving an ultimatum though, they say they're just asking area agencies to be proactive. The Coeur d'Alene Press has the rest of the story. A reminder that Monday is Martin Luther King, Jr. Day, so all area government offices will be closed. Except KMPO, that is. It's not that we don't respect the Doctor, its that somewhere along the line, before I worked here, staff voted to use MLK Day as a 'floating holiday.' That means we can either take it off, or choose to save the day off at a later date. Same with Columbus Day. So everyone else will close around 4 or 5 today and open again Tuesday at 8 a.m. Plan accordingly. That doesn't give you much time if you have government business you need to get done before Tuesday. Here at KMPO, we can laugh at ourselves, so here's a little something to get you through Friday. No, we're not traffic engineers, but our transportation planners use the same lingo in the office and we've had some of these same conversations with engineers we partner with. While that's fine within the business, we've made a big effort in recent years to make all our materials understandable to everyone, not just those who deal with traffic on an everyday basis. Legal disclaimer: we don't support or endorse the 'Strong Towns' message at the end. Enjoy! Does bicycling create jobs? A new report out of Baltimore, MD says it does. U.S. Secretary of Transportation Ray LaHood met with a coalition of bicycling advocates this week who say that pedestrian and bicycle projects created nearly twice as many jobs per dollar spent than traditional road projects. Mr. LaHood blogs talks about the meeting, and that report, on his 'Fast Lane' blog. North Idaho is struggling with slush, standing water and flood warnings. Conditions were so ugly yesterday that schools were even closed. 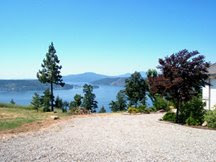 The Coeur d'Alene Press has a roundup of some of the problems residents and road crews are having. Well Idaho, you've proven yourself to be a state of prepared drivers. Between phone calls and visits to the Idaho 511 Traveler Information Service website, the 511 system has served 2.28 million people already this winter! That tops the 2.11 million who accessed the service during the entire 2008-09 snowy winter season. Idaho's 511 system helps motorists make safe travel decisions by giving them access to an array of condition reports before they leave home. Drivers can view highway conditions on more than 80 cameras strategically located throughout the state, check the latest road and weather conditions and quickly determine which routes offer driving challenges. Rep. John Mica, R-Fla., who chairs the Transportation and Infrastructure Committee, says he intends to start a process that will help craft a new multi-year surface transportation bill. Mica says he plans to hold "listening sessions" outside of Washington to get input from local and regional officials on what should be in the next transportation legislation. Some items to accomplish already on his list: retooling some current surface transportation programs to save money, speeding up projects to release funds already approved, spuring greater use of infrastructure loans from existing federal government programs and giving more incentives to private firms to invest in transportation projects. The Journal of Commerce has more. Here's a reminder of why you're not supposed to start your car then go insdie while it warms up: according to the Spokesman-Review, a man stole a pickup truck Sunday that was warming up outside a Deer Park home. The alleged car thief, 32-year-old Samuel J. Sanchez, says he stole the 1992 Ford Ranger because he was cold and tired of walking. The pickup’s owner reported it stolen immediately when he heard the engine revving and saw the truck leaving his driveway. Sanchez was picked up on U.S. 395 a few minutes later without incident. A Coeur d'Alene girl who couldn't ride a bike because of a physical condition, and couldn't join in when friends rode their bikes, has a special new bike thanks to a Post Falls business owner. And this isn't the first time he's built and donated special bikes. Because he says that every kid needs a bike. The Coeur d'Alene Press has the story. What is it with those crazy folks in Western Washington always seeming like they want to take their pants off? Yesterday was the second annual 'No Pants!' Light Rail Ride. New York's Improv Everywhere troupe started the international tradition in 2002, in which participants in various cities strip on a given winter day. About a hundred people peeled their pants off on the Link light rail, from the Westlake stop to Seattle-Tacoma International Airport. There were a few rules, like keeping a straight face and wearing non-offensive underwear, although if you watch the video below, check out the guy in the background in what appears to be green bikini underwear. I'd consider that offensive. The Citylink numbers for December are out, and while they're not up across the board again this month, they're up overall, and holding steady compared to December of last year. Check them out here. KMPO's Public Transportation Roundtable is next Wednesday, Jan. 12 from 10:30 a.m. to 12 p.m. at the Coeur d'Alene Library. Here's a look at the agenda. Roundtable meetings are open to everyone so please attend if you can. The purpose of the Roundtable is to promote continued coordinated planning and development of integrated public transportation services within and through Kootenai County. The Roundtable meets quarterly. It's getting scary for transportation. We're hearing from the public that there is an increasing amount of transportation improvements needed, but there's less money available. The House GOP last night adopted a rule that will allow the House to allocate less transportation funding than is authorized by the current federal transportation spending funding and authorization bill that governs federal surface transportation spending. The rules package will be voted on by the full House and is expected to pass. The purpose of the rule is to "prevent the government from being forced to spend more on surface transportation projects than the Highway Trust Fund collects." What it means for transportation stakeholders and agencies is that the Fiscal Year (FY) 2012 transportation appropriations bill (Oct '11 - Sep '12) will most likely provide less funding than the 2010 spending bill. The FY 2011 spending levels are yet to be finalized; the House and Senate will tackle that in February. Pro-transportation Representatives are of course expected to fight the passage of this rule, and the Senate and White House will likely support higher funding levels, but ultimately it may not be enough. Transit and rail program funding could also be more at risk. Much of the funding for those programs comes from the general fund. I'll post updates on this as they become available. The Eye on Boise Blog reminds you to clear your windshield before driving. Yes, it sounds obvious, but we've all gotten lazy, or been in a hurry, and left home with only a small circle of window to look out. Apparently that's what caused a pedestrian to be hit in a crosswalk in Boise yesterday. The victim will be fine but the driver was cited for failure to yield to a pedestrian in a crosswalk, plus driving with an obstructed windshield. 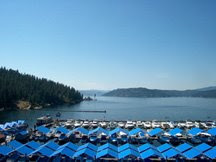 Need a taxi in downtown Coeur d'Alene? Now you'll always know where to find one, because City Council members last night voted to establish a taxi stand. And a new no double-parking rule should help to further cut down congestion in the downtown area on weekend nights. The Coeur d'Alene Press tells you where that new taxi stand is. State Highway Idaho 3 near Rose Lake has reopened to traffic, one week after a culvert running under the roadway collapsed, forcing closure of the highway. High run-off and flooding in the area caused the culvert is blamed for the collapse. A new culvert was installed and the roadway repaired. The Post Falls City Council tonight will look into updating their impact fees on new growth, plus discuss some ideas on how to reduce abandoned vehicle complaints. Here's what's on the agenda, from the Coeur d'Alene Press. Extra law enforcement patrols over the New Year's Eve weekend rounded up plenty of drivers who had apparently celebrated too heavily. The Coeur d'Alene Press reports that there were no fatal crashes, but deputies did book 16 allegedly drunken drivers from noon on New Year's Eve to noon on New Year's Day. That number is pretty close to previous years, with 17 last year and 15 the year before that. Coeur d'Alene Police made five DUI arrests, Post Falls Police made three, and Idaho State Police arrested seven in the five northern counties. DUI emphasis patrols were paid for using grants from federal dollars. Don't forget that a presentation and open house for the proposed McEuen Park Project will be held this Thursday, January 6th, at 6 p.m., at NIC’s Student Union Building in the Lake Coeur d’Alene Room. Elements of the plan will be presented and there will be opportunities for public input and discussion with the Design Team and Steering Committee. Some of the proposals for the area include removing the waterfront parking lot and constructing an underground parking structure, installing ADA compliant pathways on part of Tubbs Hill, and adding greenspace. The team behind the plan would appreciate any comments you have on it, so try to attend the meeting if you've got input. The first KMPO Board meeting of the year is this Thursday, Jan. 6 at 1:30 p.m. at Post Falls City Hall. Here's the agenda. As always, all KMPO committee meetings are open to the public, so feel free to attend. There's a public comment period also where you can put in your two cents.